Illinois State was recently honored to host 18 doctoral students from Srinakharinwirot University (SWU) in Bangkok, Thailand. The cohort of education students came to Illinois State University to attend a one-month workshop. They participated in a range of cross-departmental education courses in the Departments of Educational Administration and Foundations, Special Education, and Psychology, as well as the School of Teaching and Learning. SWU doctoral students visit Thomas Metcalf School library. A variety of Thai education professionals comprised the cohort. They included P-12 teachers and administrators and university faculty and administrators. While the workshop did not count as course credit for them, they believe the experience, research, and knowledge they gathered during their stay will be invaluable for their dissertations and professional work. “Our motivation is insight, not earning credit for this experience,” said Srihaphol, one of the participants. As part of their itinerary, the Thai cohort visited several local schools, including Parkside and Kingsley junior highs, Metcalf School, and University High School, and traveled to St. Louis, Chicago, and Springfield. The visit was organized jointly by professors and administrators of both institutions and continued a partnership that dates back to the days of former Illinois State University President David Strand. “The SWU faculty who received graduate degrees from Illinois State from the 1980s and 1990s are now leaders in their institution and maintain contact with the departments where they earned their degrees,” said Patricia Klass, interim associate dean of research, graduate and international programs in the College of Education. Kullaya Kosuwan ’04, who studied at Illinois State with James Thompson, professor of special education, formerly on the faculty at SWU, is now a faculty member with Songkhla Rajabhat University in southern Thailand. 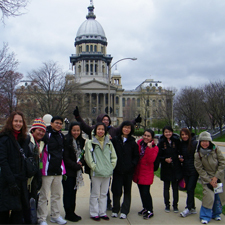 Kosuwan helped to organize the itinerary and translate for the Thai students as they participated in the workshops at Illinois State. SWU doctoral students conduct research in Fairchild Hall. “I told them about the experience I received when I was a doctoral student here several years ago,” Kosuwan said. Kosuwan has experience recruiting students not only to visit Illinois State, but also to complete their degrees here. One of those students who came here is Yuwadee Viriyangkura, who expects to graduate from Illinois State with a doctorate in special education in the fall. Kosuwan says that one focus for the SWU faculty and P-12 teachers and administrators was to learn about the cutting-edge approaches and research regarding students with special needs taking place at Illinois State. She explains that conditions for special education students in Thailand are far from ideal at this time. Classes are often made-up of 40-60 students and led by instructors who have not been prepared with strategies for including students with special needs in regular education classes. According to Kosuwan, unless their child is enrolled in one of the country’s few special education centers, families often look outside the classroom for answers. SWU doctoral students visit Springfield and the Capitol building. international partnerships, like the one with Illinois State, are important to their progress as a nation. “There are so many things that impressed me about special education here in the U.S.,” said Srihaphol. Outside the classroom, the cohort traveled to museums and city centers throughout the Midwest. In Chicago and St. Louis, the group lauded the educational value of the cities’ public museums and art institutes. “Students and young people learn a lot from these experiences, but in Thailand, we are lacking this type of education,” Srihaphol said. SWU doctoral students visit Chicago sites and museums. The value of this international partnership is mutual and integral to the vision and mission of the College of Education. Klass says that because of the similar growth, mission, and vision of these institutions, the partnership’s future is promising. And, most importantly, Thai students like Srihaphol continue to value their time here.